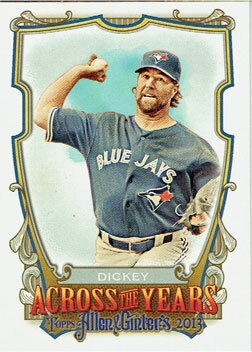 Toronto Blue Jays pitcher R.A. Dickey is celebrating his 40th birthday today, a fact noted on his “Across the Years” insert card from the 2013 Allen & Ginter baseball card set. 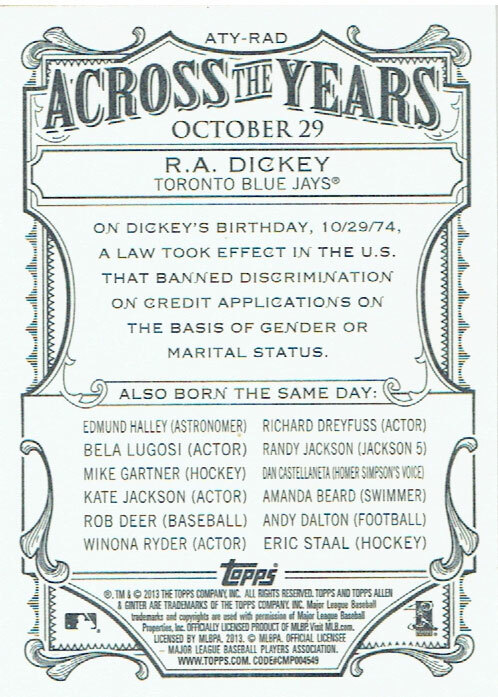 Celebrities sharing Dickey’s birthday include actors Bela Lugosi and Winona Ryder, astronomer Edmund Halley, former New York Ranger Mike Gartner and Dan Castellaneta, who is identified as “Homer Simpson’s voice” on the back of the card. Also celebrating a birthday today are current Mets’ pitcher Dana Eveland and former Mets outfielder Karim Garcia. Dickey became one of my favorite New York Mets players in 2011 and his Cy Young Award-winning performance was the highlight of 2012 for Mets fans. Since being traded to Toronto, Dickey has gone back to being a mid-rotation innings eater rather than a true ace. He finished 2014 with a 14-13 record and a 3.71 ERA in 215.2 innings, very solid numbers. The Blue Jays could decide to deal Dickey this winter – he’s in the last year of his current contract, which will pay him $12 million in 2015, but the team does hold a $12 million option for 2016. Wherever he ends up, I hope he continues to enjoy success and I will keep rooting for him. Previous Post It’s the last day of the baseball season… who’s going to win it all? Next Post Scorekeeping 101: So just who won Game 7?